The Spencer Museum of Art has selected a portrait of Marie Laveau by Ulrick Jean-Pierre as the KU Common Work of Art to accompany the 2018–2019 KU Common Book, Create Dangerously: The Immigrant Artist at Work, by Edwidge Danticat. This year’s Common Work of Art is also created by a Haitian immigrant and explores issues of history and identity. Marie Laveau was an important manbo, or priestess, who was integral to the development of the Vodou religion in New Orleans—where it is known as Voodoo. This religious practice has roots in Haiti and mixes elements of Catholicism with African and West Indian spiritual beliefs. In this way, Vodou/Voodoo and its practitioners exemplify the complex connections between Haiti, the United States, and other parts of the world. Laveau’s life is shrouded in mystery and myth, but scholars believe Laveau practiced not only Voodoo but also Native American rituals, spiritualism, and rootwork—a traditional African American folk spirituality derived from West African belief. 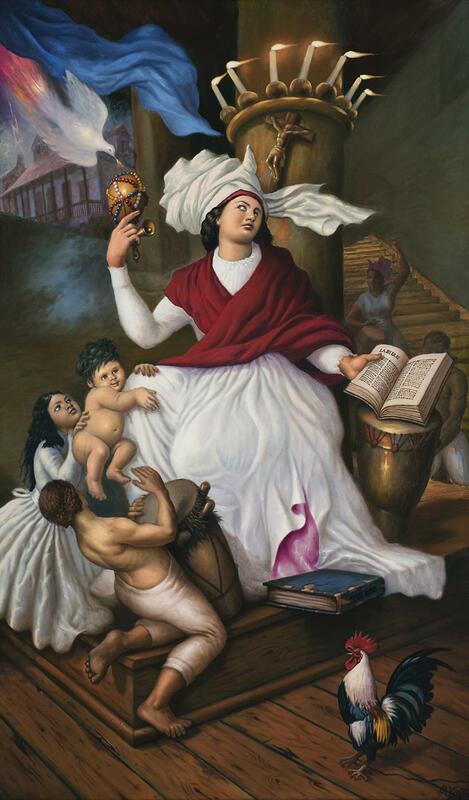 She epitomizes Creole culture and the melding of racial identities, religious beliefs, and social practices that characterized the circum-Caribbean region in the 19th century. The Common Work of Art will be will be on view temporarily in our Learning Center and then in our upcoming exhibition, The Ties that Bind: Haiti, the United States, and the Art of Ulrick Jean-Pierre in Comparative Perspective from September 8–January 6, 2019.